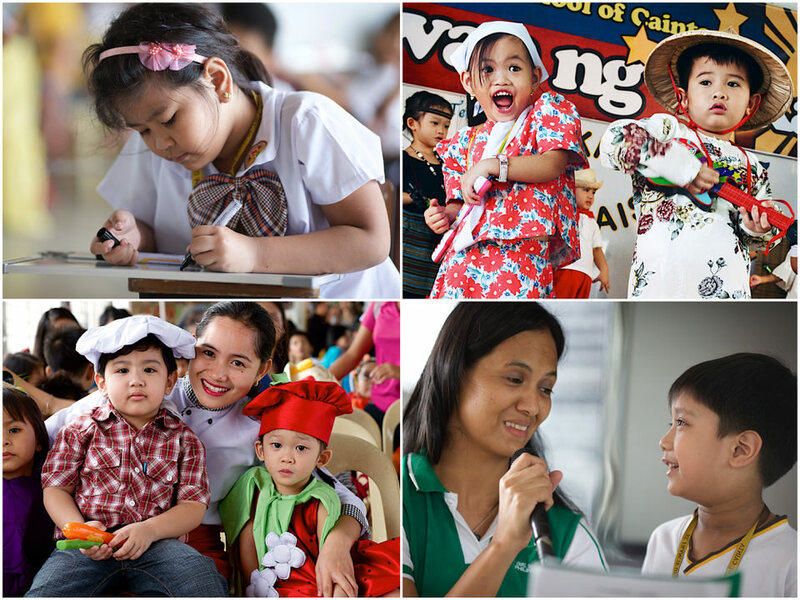 School Programmes — St. Francis Cainta - Preschool, Grade School, Junior High id="top"
This is the stage where we build the foundation of the child's academic, emotional, and social skills. In preschool, we introduce them to letters, numbers, colors, and shapes. The pupils develop the basic fundamentals of skills such as reading, arithmetic, listening, and art. We mix traditional classroom learning with story telling time, fun educational games, and art activities to keep pupils engaged and interested. For us, constructive play is an not just a way to learn but an essential form of learning. Our curriculum puts a lot of emphasis in teaching the child how read and comprehend because these are important skills essential for all academic learning. Our preschool students become competent readers once they reach grade one. Just as important, we also provide pupils various fun and interesting activities such as song and dance activities, playing social games, and joining extra curricular events with the grade school and junior high school students. These activities teaches them how to get along not only with each other but also with their older brothers and sisters from the higher levels. Through lessons, activities, games, and interaction with teacher, our preschool children are taught five fundamental values which is honesty, determination, fairness, consideration, and love. English is the main teaching language we use for Preschool. The child is introduced to a more formalised learning environment. She or he is gently and gradually exposed to more conventional learning methods such as homework, lectures, experiments, and school projects. The academic fundamentals that the pupil learned in preschool are now being built upon through more intermediate lessons. The pupil is given a taste of technical attainment and theoretical study. This is to prepare them for the transition to the more challenging subjects later on in their career as a student. It is during this stage in life when pupils develop a sense of character and a more acute awareness of what is right or wrong. The moral values instilled in preschool is expanded through values education inspired by the teachings of St. Francis of Assisi and Christ. Values education is integrated through all parts of the pupil's school life from their academic lessons, extra curricular activities, to their daily interaction with their teachers. It is in grades 4 to 6 students are introduced to the more advanced lessons, concepts, and subjects to prepare them for the demands of high school life and beyond. The intermediate grade schoolers receive more challenging work and activities to hone their intelligence in academics and help them build a stronger character that is hardworking, tenacious, and diligent - important characteristics of successful people. From grade 4 and above, students are given more chances to exercise more responsibility and develop their talents further by being permitted to join student circles and organizations like the Student Council, varsity teams, choir, and the many other student clubs. This also the time when they begin to become aware that they are a part of a larger society so important values of civil society such as respect for others, the importance of honest work, and taking responsibility for one’s actions are inculcated through through lessons and activities. Junior high is an important stage of a student’s life because this is when they prepare for their future careers to become productive adult members of society. Through grades 7 to 10 we cement the mastery of vital subjects such as Mathematics, Science, English, and Filipino. Mastery of these tool subjects equips the students with a strong foundation to study and cope with college level subjects and beyond. The SFAMSC curriculum also integrates advanced college level lessons to its junior high school curriculum to familiarize students with more difficult and advanced academic concepts. To teach them to become future leaders, junior high school students they are given more prominent roles in the student council, student clubs, varsity teams, and in assisting teachers in special activities. Junior high school students are given a full schedule of academic and extra curricular activities. Through their busy schedules they learn and develop practical values such as diligence, a strong work ethic, time management, critical thinking, and cooperation - important life skills needed for a successful life. In the light of the new K+12 program, the SFAMSC curriculum helps the junior high school students prepare for the challenges in entering and prosper in the senior high school and the college of their choice. The school also provides personalised tutorial services for students. The tutors assigned to your child are qualified teachers trained by SFAMSC to instruct and guide the child. Tutors of St. Francis Cainta teach the child by assessing individual strengths and weaknesses and tailoring lessons to the child’s abilities. The goal of our tutors is to make complex lessons easy to understand for their students. Tutors also build trust and cooperation with the child’s family through regular updates and discussion with the parents or guardians regarding the progress of their children. We offer our students two kinds of extra curricular activities. First are the school events such as Book Week, field trips, Family Sports Day, Nutrition Month, Scouting Jamboree, Bwuan ng Wika, and Academic contests. One the student reaches Grade 4 they are given access to thethe second type extra curricular activities which are student clubs and organizations. Examples of student organisations are the Student such as the Student Council, sports varsity teams, glee club, film and drama club, art club, and much much more. Studies show that students who are active in extra curricular activities have many positive advantages. Exposing students to different kinds of stimulating and educational activities inside and outside the classroom promotes the development ofthe mind and also nurtures important social, emotional, creative, and problem solving skills that transform them into well rounded person who is high in both areas of IQ and EQ. Click here to learn more about school events and here to learn more about student organizations. The summer vacation is a great opportunity for students to learn new skills, enhance their talents, or even get ahead of their studies by taking a summer workshop. SFAMSC has various summer offerings from reading and mathematics workshops to intensive modern dance courses and piano lessons. Studies show that students who are active in sports, music, and academics during summer vacation become healthier, smarter, and achieve higher grades! Please click here to download a brochure that list courses offered this summer 2016!